This recipe can be modified, made stronger for use with very sick crabs, although this strength is fine for more minor cases! First, you’ll need to make a decoction. Take one quart of water, and heat it over the stove to near boiling. Add one tablespoon marshmallow root, and one tablespoon myrrh. Cover, and simmer for thirty minutes. Remove from heat. Add one tablespoon calendula flowers (marigold) and one tablespoon whole chamomile flowers. Cover immediately again. Let sit until cool, then strain herbs out and refrigerate. It will last a max of 48 hours. The herbs are all safe, they can even be fed to the crabs. I routinely feed calendula and chamomile to mine. When bathing the crabs, bathe the affected parts only. I don’t see any need to get the stuff on the gills, unless there is an infection of the abdomen. The reason I say this, the marshmallow root makes a slime coat, which is sort of thick, and is not beneficial in the shell unless you’re fighting an infection in that area. 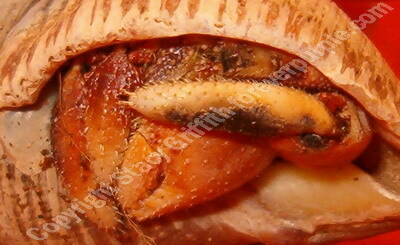 If the infection is in on gills or soft tissue you can leave out the marshmallow root. So marshmallow root draws out infections, draws out splinters, and makes a thick slime coat layer that helps prevent infection and aids in healing. Myrrh powder (like what was given to Baby Jesus), is a powerful anti-bacterial, yet unlike antibiotics, is completely safe for crustaceans. Calendula flowers (marigold), gently stimulates the immune system, is a mild anti-bacterial and anti-fungal, and cuts down on healing time. Chamomile flowers, reduces inflammation, helps to speed healing, and reduces swelling when it is present. A few words of caution: do not use powdered herbs; you really need to find the bulk medicinal herbs, because too many properties evaporate when the herbs are crushed. If you drink chamomile tea, and do not find it that relaxing, you should try a cup made from the whole flowers. There is a noticeable difference. And second, all the properties of chamomile (the essential oils) evaporate with the steam. That’s why, when cooking herbs that have any essential oils, you must trap all the steam and let it cool, so the medicinal contents will remain in the formula. Veterinarian recommendation: place the crab in clean sand, increase light exposure and bring humidity down to 70% and maintain there. Lower humidity retards the metabolic rate of the bacteria but 70% is the lowest a crab can tolerate while being treated. This must be done in isolation. 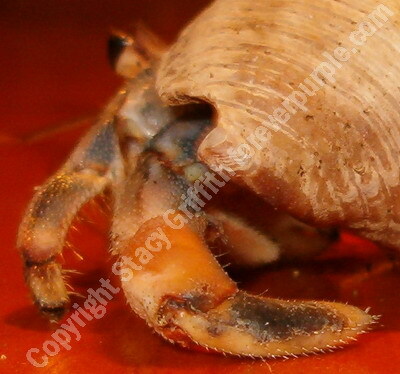 Bacterial shell diseases are highly contagious but can be shed with a good molt. This concoction should be steeped after the water is boiled. Let it sit for about 20 minutes, strain out petals. 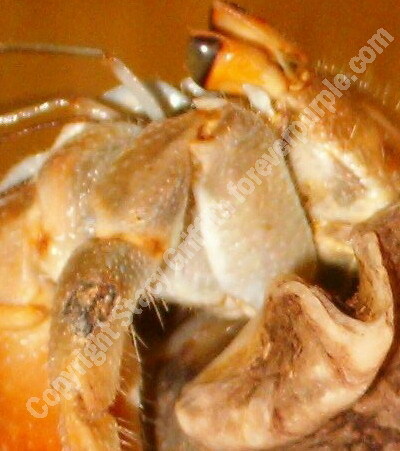 Wash should be applied 2 times a day for 3 days, let the crab sit in it as there may be lesions on his shield and abdomen. It will benefit him if he retains it as shell water. After the first few days if you notice more lesions forming or see more discolored depressions in his chitin, you may not be able to stop the progression of the disease. If you do notice that there is no more formations, change out the substrate for new and watch him in ISO for at least another week. You can repeat the process again if you see reformation occurring. I think it would be up to you if you want to continue, but remember to keep this crab separate until you are sure that he has no active growth of the bacteria on him. With my indo BOB, he remained in a 2.5 gal ISO until he molted. Bob came up from his molt like this. This spot was suspected shell rot. The deformation of the claw is from an unidentified toxic substance, or even from the bacteria being present when he molted the first time. This was after his molt and after the bath treatment. I think it contributed to him molting again so soon, and while his claw still is undercut, there was no spot or depression in his chitin. Sorry for the poor quality of the pictures, I lost the originals when I had a hard drive crash. 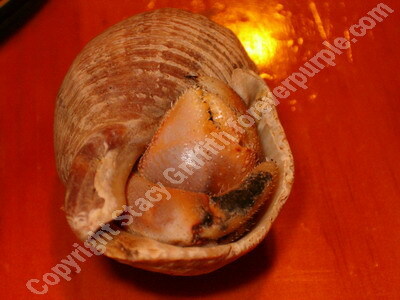 The main recipe was given to Daethian(Stacy Griffith) via email from Gert Snicklegrove in 2005. The best of our knowledge she is the creator of this recipe along with Summer Michaelson. The second portion is an adaptation created by Sue Latell of Coenobita Research after speaking with her vet in 2006.